"This dish is one of my favorites. If you like goat cheese it will become one of yours as well. I was inspired to make this dish after trying a similar one made with chicken at a local restaurant. Serve with a nice crusty loaf of french bread, a garden salad, and a glass of your favorite red wine!" Meanwhile, heat olive oil in a large skillet over medium heat; cook and stir green onions and garlic until onions are tender, about 4 minutes. Add artichokes, tomatoes, capers, and chipotle chile powder; bring to a boil. Reduce heat to low and simmer. Place shrimp into sauce; cook and stir until they are bright pink on the outside and the meat is no longer transparent in the center, about 5 minutes. 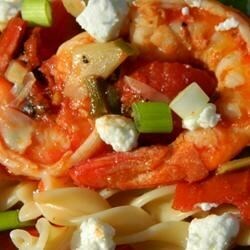 Divide pasta evenly into 4 bowls and top with shrimp and tomato sauce. Scatter goat cheese over sauce. This was absolutely delicious!!! I used a can of diced fire roasted tomatoes instead of the whole tomatoes. It saved some time. My fiance loved it, too. Thanks for posting it. This recipe was delicious , I will try adding some baby spinach next time i make it (extra veggies). This is one of those recipes that I would not change in any way. Add a glass of crisp pinot grigio, a green salad, and the it's a perfect dinner.